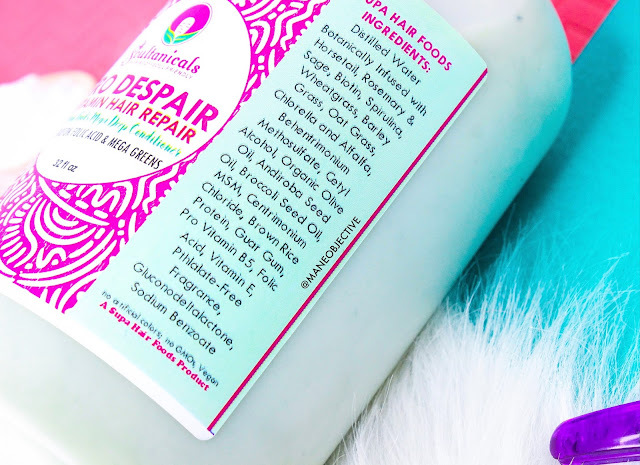 So many great ingredients make 'Fro Despair a powerhouse for natural hair. 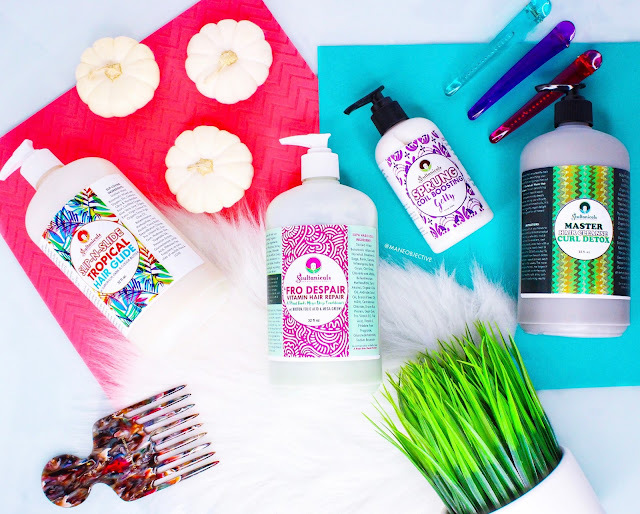 I am completely, utterly, and hopelessly obsessed with 'Fro Despair Vitamin Hair Repair. I'll tell you why - but first, let me break down how we got here (and why I dedicated the opening verse of Int'l Players Anthem to it lmao). Suffice it to say, Afrotastic Curl Elastic and I were meant to be together. But then, the strangest thing happened. 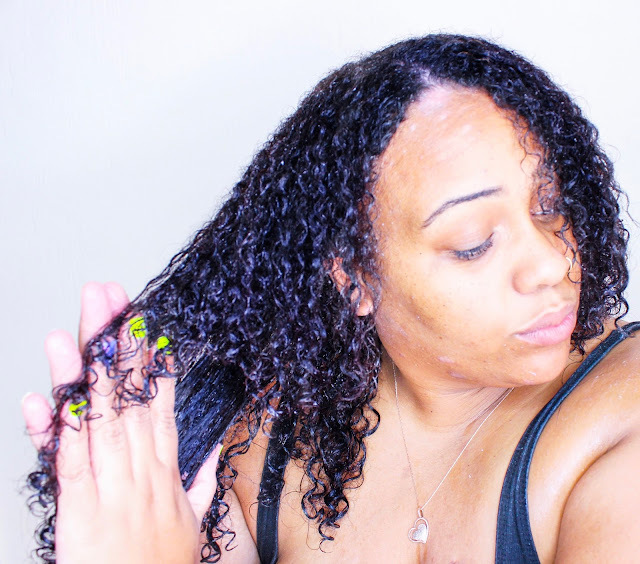 Through my 7 Days of Self Care with Soultanicals series, I was introduced to 'Fro Despair Vitamin Hair Repair on Day 5 of the series, inspired by tending to my home garden. It was love at first detangle. The slip is off the chain. I was immediately conflicted - like, am I 'bout to sit up here and cheat on Afrotasticbae? If I had to choose sides, who do I pick? Exclusively at www.soultanicals.com. My prayer is that eventually, this deep conditioner will enter Target in the way that Afrotastic has done. Ingredient closeup. Yes, there's even MSM! Water infused with Horsetail, Rosemary & Sage: Herbal infusion that promotes growth, strengthens the follicles, and staves off hair loss by stimulating blood circulation. Biotin: A water-soluble vitamin, vital for the body's normal processes such as synthesis of protein and conversion of food and stored fats into energy. It's also a major role player in maintaining the health of the skin, nails and hair. Organic SuperGreens (Spirulina, Wheatgrass, Barley Grass, Oat Grass, Chlorella, and Alfalfa): This combination of superfood algae and grasses work in tandem to help slow and reverse signs of aging and damage while nourishing the scalp to promote healthy hair growth. Behentrimonium Methosulfate: Gentle surfactant made from non-GMO rapeseed (canola oil), and is one of the mildest detangling ingredients out there. It doesn't cause buildup or irritation to the scalp. Cetyl Alcohol: Considered "fatty alcohol" -- NOT to be confused with drying alcohols such as ethyl. Acts as a lubricant, thickener, and emollient and gives conditioner its velvety feel without making hair greasy. Also used to keep product ingredients from separating. Organic Olive Oil: Olive Oil is rich in high levels of mono-unsaturated fatty acids and vitamin E. Vitamin E is an antioxidant, which is good for hair growth. Both mono-unsaturated fatty acids and vitamin E are good for moisturizing, protecting and nourishing hair. Olive oil makes hair grow stronger and its emollient properties prevent hair loss. WHERE DO I BEGIN?! Seriously, 'Fro Despair is life giving. It's literally like a green juice shot for your hair and scalp. First of all, the ingredients are freakin' stellar. I could be totally wrong, but I've yet to see any brand pack so many greens into a deep treatment. And it's not just a "very bottom of the list, just a pinch in there so we can claim it on the label" amount, either. 'Fro Despair is literally green, and you can see the flecks and grains of green powder without putting your face all up in it. Consistency-wise, 'Fro Despair is creamy like Afrotastic, but not quite as thick. It's very spreadable, but not at all watery. And the slip? Off theeeeeeee charts. It's so easy to use, and I'm deeply appreciative. The last thing I want to do on wash day is fight with my deep conditioner. The fragrance is a toss-up. My first bottle (back in July) and my re-up (September) both have a deeply green and grassy fragrance - which played quite nicely into the whole "SuperGreens" theme (and made me feel like I was doing my hair major favors). I don't EVER want to run out of 'Fro Despair. But then I got another 8oz bottle with the grassy essence played way down in favor of a fragrance that I could only describe as something I'd grab from the cat selling oils and incense on Crenshaw (is he still there? Or did gentrification get him?). It's a yummy fragrance that I definitely enjoy. But I like the grassy vibes, too. I'm not sure if this was an error, or if the fragrance is changing for more commercial appeal - but I'm good either way. Just don't change the formula, Ayo! The real win is how ah-MAY-zing my hair feels after I rinse. Soft, baby smoove, like buttah, and STRONG. 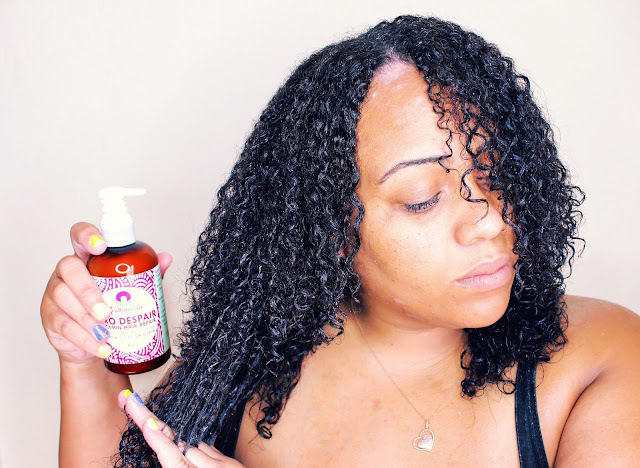 Soultanicals has definitely cornered the market on moisture and strength with 'Fro Despair. It literally does not get any better than this. This is peak deep conditioning, people. I couldn't point out something wrong if I wanted to. You don't buy liters of products you aren't passionate about. 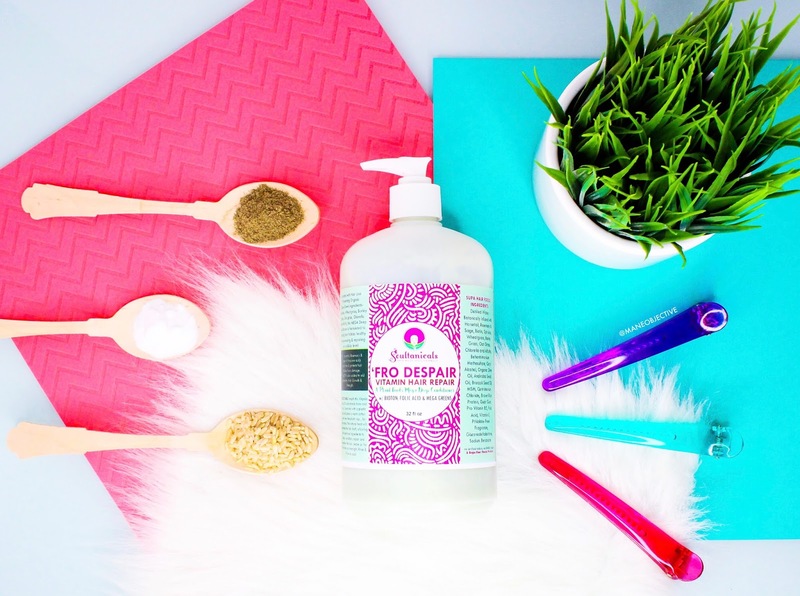 Loaded with as much slip as it has greens, 'Fro Despair is literally Amazing Grass and the best of what Pressed Juicery has to offer - in deep conditioner form. While I think everyone and their cousin TeeTee could benefit from the goodness that 'Fro Despair has to offer, it works best on hair that is damaged, distressed, color treated, weak, brittle, or just in need of a strengthening boost. In short, 'Fro Despair has joined the rank of the Holy Grail. Just don't be surpised when Christina's Choice 2017 rolls around. Have you tried 'Fro Despair yet? Let me know your thoughts in the comments below! I've tried the Fro Despair before but was mostly meh on it. Something about the pH is a little off for my hair. As I was rinsing it out, my strands began sticking to each other and my hand like static cling. While my hair was soft and nourished afterward (post leave in), the potential pH issue has put me off this DC. I still love plenty of other items by Ayo though. Hi! Check also my page! A lot of interesting!